Do you need help finding the best steam generator iron in the UK? Allow us to give you some guidance. We understand the situation too well. For the most part, the answer is no. However, your lifestyle will determine which irons work best. Little is worse than spending £500 on a product, and not using any of its special features. Therefore, we compiled a list of the best steam generating irons in the UK. This list will help anyone find the perfect iron—ranging from the busy mum of four to the single bachelor trying to look dapper. We found irons from all budgets and household limitations as well. Join us, and find the best steam generating iron for you! 2 What Is a Steam Generator Iron? 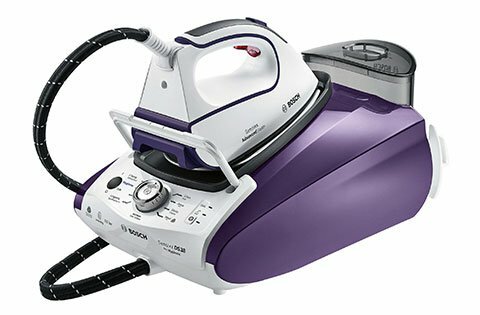 4 Which Steam Generator Iron Is The Best? Let’s answer the big question that might be on your mind at the moment: What is a steam generating iron? And more importantly, why would you want one over a normal iron? Generally speaking, steam generator irons come with detachable water tanks. These irons eject jets of pressurised hot water at the surface of garments being ironed or steamed. This removes creases with ease. Compared to a classic iron, steam-generating irons produce constant steam for longer periods of time. This results from their large water tanks, which retain up to 4x as much water as a normal iron. Do you dislike the flimsy structure of classic irons? If you answered yes, you will be happy to learn that steam generator irons work as more durable units with more functions than normal irons. Who benefits most from these irons? For the most part, people who iron in bulk will enjoy the features of these irons. The large water tanks allow for long (2+ hours) iron sessions without breaks. Also, note that these irons often present luxury features such as fabric sensors and the power to produce more steam than a normal iron. Therefore, if you want to remove creases from fabric—and look like a paid tailor did this for you, you will prefer these types of irons. These irons cost more than normal irons. However, no one can argue with the time these irons save in performing lengthy household chores. Also, these irons flatten creases from fabrics better than most other products on the market. If one of these irons fits in your budget, consider one for your home. You will not regret the work produced from these household tools. You will find two types of steam generator irons—pressurised and non-pressurised. The difference between the two types of irons is simple. Pressurised irons force steam from their soleplates with much greater force than a non-pressurised iron. The pressure penetrates deep into fabrics. The process also saves hours of ironing time. Non-pressurised irons produce less force. However, they will still iron garments much faster than a classic iron. Also, note that non-pressurised irons are often less expensive than pressurised irons. How do you decide which pressure option to choose? Consider your budget and time. If you do not mind spending some extra pounds to save some hours ironing, consider a pressurised iron. If you want a thrifty option, select a non-pressurised iron. Are you trying to find luxury features on your steam generator iron? Look no further than the Philips PerfectCare Elite series. With the company’s GC 9650 model, noise no longer acts as an issue. To make matters better, this iron sports some of the highest pressure options of any device on our list. If you want an iron to speed through your chores, continue reading—this might be the perfect iron for you. One of the reasons you are buying a steam generating is to iron in bulk. Nothing makes this task easier than a large water tank. Thankfully, This Philips model ships with a 1.8 L water tank. This will allow you to iron for 2 consecutive hours without refilling the tank. Our team admired the large filling hole. The gap is large enough to fill the tank from any tap without spills or messes. Also, if you need to refill in the middle of ironing, you will not need to unplug your iron. Simply detach the tank, refill, and wait for the water to warm. What is an iron’s main function? For most people, the answer is removing creases and wrinkles. The steam power and output decides how well this iron will flatten clothing. 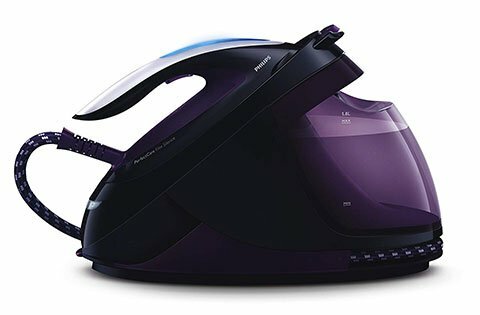 How does this Philips iron compare with others in our list? Exceptionally well. The iron produces 150 g/ min of constant steam. At 7.5 bar pressure and a steam boost of 500 g, creases stand no chance against this iron. In fact, flattening garments never felt so fast or easy. The pressure is enough to penetrate through layers of fabric. This allows you to only iron one side of a garment if you feel rushed. These steam settings are ideal for vertical ironing. Of all the irons on our list, this device was one of the best at steaming our curtains and hanging garments. We had nor problems flattening deep creases. Here’s the best part of this entire iron. The device contains fabric sensors (dubbed OptimalTEMP by Philips). These adjust the heat and steam pressure to each garment—without you needing to push any buttons or turn dials. In fact, this iron lacks any form of temperature dial. This is not an issue, as these sensors will not allow your fabrics to burn. We tested everything from denim to silk. Each time, the sensor applied the correct heat and steam. None of our fabrics burnt. This also means you can place the soleplate on your ironing board without burning the board’s surface. OptimalTEMP is a nice feature when taking breaks or when changing garments. This sensor is one of the best features of any iron on our list! Do you want one of the best soleplates on the market? 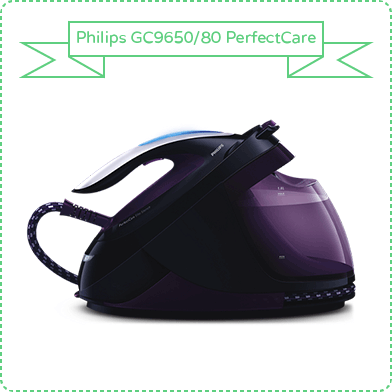 The Philips PerfectCare Elite series offers one of our favourites on the list with its T-ionic Glide plate. The ceramic plate glides smoothly across any fabric. We noticed no problems removing creases from garments, or when rubbing across buttons and zippers. Phillips coated this plate with a titanium oxide layer. This coating reduces scratches, which prolongs the life of your iron. Let’s get this out of the way now: This steam generator iron is one of the most expensive on our list. Here’s the big question—Does it have the extra features to live to its hype? You will find all your standard features on this iron. If you need help with storage or carrying your device, the iron locks to its base. The iron also packs an auto shut-off function. This offers a safety feature since you can leave your iron unattended without fear. The feature will also help you save some money, since you will not waste power when you forget to power off your iron. Speaking of power—if this is a concern to you, check this iron’s ECO mode. The function reduces the steam output when ironing garments. This is a mode to consider when ironing less stubborn fabrics. Remember, you will need to clean your iron on a routine basis to prevent buildup of limescale. Otherwise, you will destroy your iron. To help with cleaning, Phillips includes a De-Calc plus feature with its iron. The device sends a reminder with lights and sounds when you need to clean your iron of its limescale. Cleaning is easy. You simply brush the limescale with the provided knob. Brush the scale into a cup or trey, and then discard the waste. Remember to clean on a cold iron. The process takes less than one minute. If you want to reduce the time you spend ironing, you will need the iron to start quickly. At 2400 watts, this iron heats in two minutes. Compared to other steam generator irons, this time is standard. You will hardly lose any time before you begin ironing your garments. Do you want to know how this iron stands out among others on our list? Aside from exceptional performance, this iron is quiet. During our tests, we heard no noise. Naturally, steam boosts will produce a loud sound. However, you will spend most your time gliding your iron across your garments. This action produces no loud or annoying sounds. Temperature sensors—soleplate down while ironing. Cord is difficult to fasten to sides of base for storage. Might receive an unwanted shower if stored high with water in tank between uses—slightest tilts empty tank. We won’t side step the issue—this steam generator iron is one of the most expensive on the market. However, we cannot deny the phenomenal performance of this device. The OptimalTEMP technology will save you hours during your ironing. No other iron will offer you such convenience. If budget is not an issue for you, consider buying this iron for your home. Do you prefer ironing in bulk? By bulk, we aren’t just talking about a 45-minute session. We are referring to spending an entire afternoon ironing garments. If this sounds like you, the Morphy Richards 332013 steam generator iron may be for you. This tool packs one of the largest water tanks you will ever find on an iron. Combine that with an auto clean function, and you are looking at an iron that will save hours from your ironing chores. The 2.2L removable water tank is huge. No other iron on our list provides a tank of this size. During our tests, we averaged 2 ½ hours of constant use before refilling the tank. The size of the tank alone will save you hours in ironing a large bulk of fabrics. Because the tank is removable, you will not need to unplug your iron for refills. Not all is perfect with the water tank. For some reason, the designers chose a red plastic colour for the tank. The colour looks nice…until you reach low water levels. Seeing the water inside the tank is difficult. To help with this problem, the iron offers a low water level indicator light. This will allow you to judge when to refill. However, sometimes you will want a more exact measure of whether or not you should refill the tank with water. Moving to the handle, our team felt mixed results. On the one hand, the handle allowed for a comfortable grip while ironing. However, the handle itself is large. This will provide some problems for people with smaller hands, especially when ironing for hours at a time. How does the steam compare to other steam generator irons on our list? At 6.5 bar pressure and 200 g/ min, the numbers seem low. However, the iron still performs an exceptional job at removing creases from fabric. During our tests, this iron flattened creases from most garments, ranging from cotton shirts to silk bedding. The iron provides enough pressure to penetrate through most layers of fabric. When you are in a rush, you can iron one single side of the garment, yet remove creases from both sides. If you feel you need larger steam output, you can boost the steam to 310 g/ min, which will give you plenty of power to remove the toughest of creases. Note that you will need to hold a button for continuous steam, as this device lacks a steam lock button. Do you need to adjust the heat for more sensitive fabrics? The Morphy Richards iron provides three different steam settings. The lowest result sprays no steam. Our team could not find much of a use for the first setting. However, settings two and three offered enough steam and heat to remove creases from any garments we tested. The iron provides a temperature dial. This allows you to select appropriate heats to suit your garments. Reading the dial is easy. A temperature indicator light tells you when the iron reaches the correct temperature. Once the light turns off, this is the signal you can begin ironing your garments. Do you want to iron any hanging garments? This task is no problem for this Morphy Richards iron. The process is simple. Hold the iron a few cm away from the fabric. Then press the steam boost button or the steam trigger button. During our tests, the vertical steam feature removed creases from hanging garments well. This iron provides 2400 watts. What does this mean for your ironing? We found this number only required us to wait three minutes to use the highest level of steam. Compared to other irons of this type, the wait was average. Here’s some important information about this iron. Remember, iron can produce all the steam power and heat in the world. However, it equates to nothing if the soleplate decays. A broken soleplate means you will spend countless dollars replacing your irons. Thankfully, Morphy Richards’s “Ceramaslide” soleplate performs its job well. During our tests, the plate slid smoothly across fabrics of all types. The soleplate consists of ceramic. This means the surface is scratch resistant. Therefore, buttons and zippers produce minimal damage to the iron’s soleplate. This will ensure a lengthy lifespan for this steam generator iron with proper care. Does a large water tank not save you enough time when ironing? If you still want more convenient features, look no further than Morphy Richards 332013’s auto clean feature. The iron removes limescale on its own. This means you will not need to waste any money buying extra filters. You will also waste less time cleaning the device. A descale indicator light will inform you when you will need to manually rinse the iron. However, note that rinsing this tool is an easy task anyone can complete in a matter of minutes. 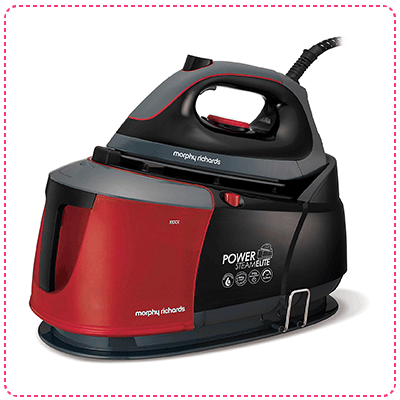 Morphy Richards 332013 provides all the standard features you would expect of a steam generator iron. For safety, you will find an auto shut off on this device. This is a great feature anytime you leave the iron unattended. You will also find a safety carry lock for attaching your iron to its base. This allows you to easily carry the iron around your house and provides easier storage. Lastly, the iron ships with a two-year warranty. This will ease your mind if any pieces malfunction. Hard to see water levels with red plastic tank. Bulky handle is not for everyone. 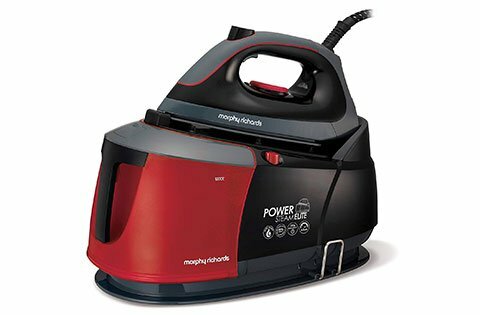 If you perform your ironing in bulk, this Morphy Richards steam generator iron will be your best tool for the job. A massive water tank and auto cleaner ensure you save as much time as possible. Naturally, a large water tank means a bulky design for this tool. However, if you can find the space, the size becomes no form of issue. Are you searching for a more budget-friendly version of the Philips PerfectCare Elite Silence Steam Iron Generator? Thankfully, Philips released a slightly cheaper model in their PerfectCare Elite series with its GC9630/20 model. You will notice many similar benefits. If you are a fan of the PerfectCare Elite system, continue reading. The iron weighed 0.8 kg. This is a light and comfortable weight for ironing. The handle fits comfortably in most people’s hands. A steam spray switch rests comfortably below the handle. Spraying garments or ironing vertical fabrics never feels awkward with this iron. Do you want an easy to use iron? Steam generator irons do not become much easier than this device. The iron sports two buttons. One button starts ECO mode, while the other is your on/ off switch. Much like other Philips models, you will hold the buttons for different functions. For example, holding the power button acts as the turbo steam switch. Do you plan to use your iron for lengthy continuous periods of time? If this is your main reason for buying a steam generator iron, then you already know the water tank is an important feature. The Philips GC 9630/20 model offers a detachable 1.8 L tank. This size is standard for this type of iron. You can iron fabrics for two hours without breaks. You will also notice a large filling hole sitting atop the tank. This gap fits nicely under any tap, allowing for easy refills. An indicator light turns red when the tank is almost empty. Does the performance of this iron meet the expectations Philips already set for us? The answer is yes! With 6.7 bar pressure and a steam boost of 470 g/ min, this iron will remove creases with ease. In fact, this iron quickly smoothed any fabrics we tested. Philips employed its OptimalTEMP technology in this iron. This is a system that detects the fabric beneath the iron. The device then applies the appropriate amount of heat and steam pressure. Our tests found the sensors to be extremely accurate. Even better, the heat will not burn any fabrics. We even tested this against delicate silks, and we noticed no burns or damage. You will save time since you will no longer need to read special care instruction labels. Because this iron does not burn any fabric, this also means you can place the soleplate facedown on the ironing board and see no damage to the fabric. This is great for placing the iron while ironing. You will not need to worry about accidentally touching the hot surface. As we would expect, Philips placed on of the market’s best sensors in their steam generator iron. Do you want a top quality soleplate for your iron? Of course, you do! This is a feature that prolongs the life of your iron. Thankfully, Philips delivers with its T-ionic glide plate. The stainless steel glides smoothly over any fabric. To make matters better, the plate is coated with titanium oxide. This adds some scratch resistance to the soleplate’s surface. During our tests, we noticed no scratches, even when ironing across buttons and zippers. The Philips GC9630/20 comes with 2400 watts. This provides enough energy to heat your iron in two minutes. This is a standard warm-up time for most steam generator irons. The iron also comes with an auto shutoff feature. After a few minutes of no use, the iron powers down. This feature will save energy if you ever leave your iron unattended. The option also provides a great safety feature since you will not worry about anyone touching the hot surface of the soleplate. This iron also offers a vertical steam feature. If you ever need to remove creases from curtains or hanging garments, this tool will be helpful to you. Do you want to save money on your next power bill? Eco mode will help if you answer yes. This feature reduces the steam and heat produced from the iron. You will find this option most helpful when ironing garments with few or mild creases. We all know cleaning your iron is important. This Philips iron provides you with a De-Calc Plus feature. When you need to clean the scale from your iron, the front of the iron produces lights and sounds. You then use the included knob to scrape any limestone from your iron. This is an easy process. 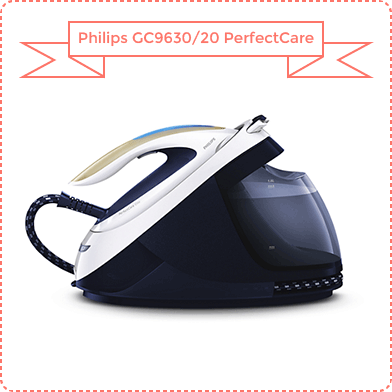 The Philips GC9630/20 offers all features you would expect from an iron of its type. A carry lock fastens the iron to its base without the device slipping. This is also helpful in preventing people from touching or damaging your soleplate. As you would expect, this feature allows easy storage and transportation of the iron. This iron is one of the pricier options on our list. Thankfully, Philips ships its device with a two-year warranty. This means you will not need to purchase a brand new iron if any pieces malfunction. Great Sensor—temperature and steam are accurate for fabric. At the end of the day, The Philips GC9630/20 is a cheaper version of the Philips GC9650/80 model. For the most part, you receive the same options, but at a cheaper price and with less power. Therefore, consider your budget before buying this iron. If you do not wish to spend so much money for the Philips GC9650/80, this is your next best option. Pro-hygienic settings offer something new in the world of ironing. Yes, other irons will cleanse fabrics to some extent. However, This Bosch iron focuses its irons toward killing bacteria within fabrics. Combine this setting with all the standard features of steam generator irons, and you have one of the top ironing tools on the market. 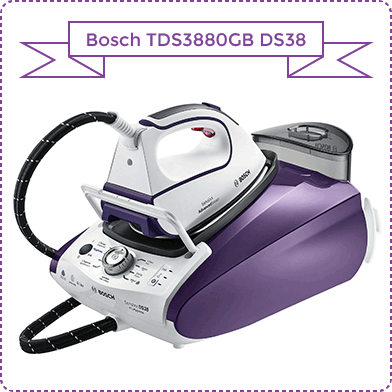 If you value hygiene, continue reading our review of the Bosch TDS3880 GB DS38 Sensixx ProHygienic Steam Generator. The iron ships with a 1.4 L detachable water tank. The tank allows for just under two hours of constant ironing before needing a refill. If you have troubles seeing the water, a light will inform you when the tank requires a refill. Do not worry about restarting your iron. You will not need to unplug the steam station. Therefore, the device remains hot, even if you stop to refill your tank. Where do you place the iron when refilling your tank or switching garments? Bosch provides a plate to fit around your soleplate. This item will prevent the iron from burning the fabric on your ironing board. This is a great option since the soleplate faces downward. This prevents any harm from accidental touches. More importantly, you will not need to worry as much about the iron tipping off its board and damaging your flooring. This feature also reduces the risk of the iron falling and harming family and pets. Here is another nice feature about this iron. The LED lights surround a turning dial. This ensures you always know which heat and steam settings you select for each fabric. Using this iron is as easy as turning a knob and selecting a garment. We now know this iron is easy for storing. However, here is the big question we all want to be answered—How well does this iron remove creases from fabric? With 6.5 bar steam pressure and 120 g/ min for constant steam, this iron removes creases from most garments well. 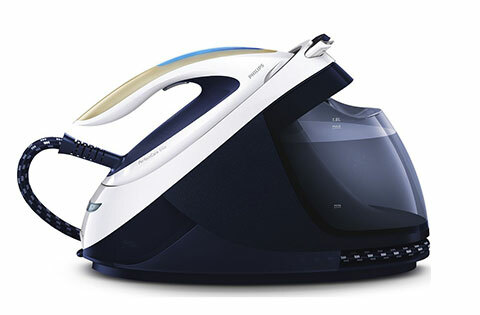 If you need more steam output, the iron allows for 440 g/ min steam shots for the most stubborn of creases. During our tests, we never struggled with flattening and smoothing any type of fabric. How does this iron adapt to different fabric types? This iron provides eight different power settings. During our tests, we found no real tests for the lowest setting. Our team found the lower settings left some mild creases. However, this is a decent option for more delicate garments, such as silk. Most of our irons applied the highest power setting, which removed creases from most fabrics with ease. If you are unsure which power setting to use, you simply switch between preset power and steam levels. You select the fabric, and the iron chooses the appropriate heat and steam shots. We noticed the presets worked well with the irons listed fabrics. Are you not trusting of the preset settings? Bosch is here to help. The company’s i-Temp Advanced automatically adjusts to each fabric with appropriate steam and heat. This will save time when ironing in bulk since you will not need to toggle between settings. This is not a burn proof feature, so we would advise against resting the heated iron on your fabrics. Do you want to try something new with an iron soleplate? Bosch implements a Palldadium Glissèe soleplate. The plate feels similar to ceramic with high scratch resistance and smooth gliding. The plate employs a three-phase design. The purpose of the phases is to allow for moistening, drying, and smoothing in each sweep across the fabric. We noticed we needed to clean the plate frequently. However, the soleplate provides exceptional performance, so we sill do not complain too much about the cleaning requirements. How long does this iron take to heat? The iron operates with 3100 watts. This wattage allows the tool to operate on par with other steam generating irons. During our tests, the iron heated in two minutes, which is not a long wait time. Does reducing your power bill something you want in your iron? If you answer yes, you will appreciate the ECO option of this iron. This mode applies energy-saving settings. The iron spends 40% less water and 35% less energy. You will find this mode works well when ironing mild creases from your fabrics. If you iron enough on this setting, you will notice a reduction in your energy bills. The energy saving does not stop here. Bosch’s device includes all the standard features you would expect from a steam generator iron. You will find an auto-shut off feature on this iron. This will save your power bill from rising too high those days you forget to power off your iron. This is also a great safety feature for those times you leave your iron unattended. You will also find a carry lock to attach the iron to its base. This feature worked, but our team questions the durability of the lock. The piece felt flimsy during our tests. This is a bit concerning since this feature helps with storage and carrying the iron across a room. By this point, you already know you will need to clean your iron to prolong its lifespan. This Bosch model includes a self-cleaner in the iron boiler. This feature removes limescale and irons that clog and decay your steam generator iron. If you decide to manually clean your iron, you should not find too many issues with rinsing and scraping scale from its surface. Do you worry about damaging your iron? Bosch offers a one-year internal manufacturer’s guarantee. If you register the product, you will also receive a manufacturer’s two-year guarantee. Therefore, you will not need to worry about parts breaking or malfunctioning. Lastly, if you ever need to iron curtains, the iron provides a vertical spray function. Combined with the pro-hygienic settings, this feature will act as one form of sanitising parts of your home, along with hanging garments. Are you ready to learn about the large selling point of this steam generator iron? Bosch employed a Pro-Hygienic setting within its iron. This feature combines high temperature, steam pressure, and intermittent steam to remove bacteria from fabrics. We all enjoy hygiene. Why would anyone want bacteria in their garments? More importantly, most of us enjoy saving money. You will lower your power bills by reducing the heat settings in your washes since this iron will remove bacteria for you. Accurate preset temperatures for common fabrics. Do you find yourself limited with storage space? 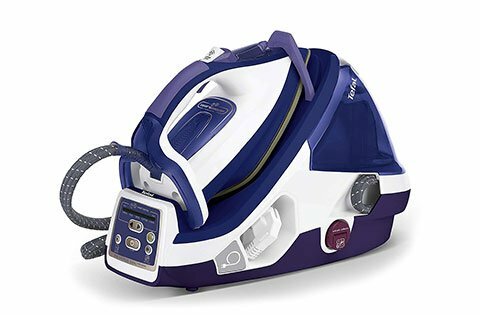 This steam generator iron will provide you with some of the best options you will find on the market for storage. This is made better by pro-hygienic features if you prefer sanitising your garments. Just note that the piece that locks the iron to the base of the device feels flimsy, which can cause future storage and transportation problems if the pieces break. Do you have problems removing the most stubborn of creases from your garments? The Tefal GV8976 provides some of the best tools for smoothing deep wrinkles. This device also offers some interesting storage options. Top this with a sleek appearance, and we have a contender for the UK’s best steam generator iron. With four other amazing irons on our list, can Tefal’s model compete? Read below to learn more. Let’s shift our attention to a feature that will impact this iron’s performance—the water tank. Tefal includes a 1.6 L water tank with its iron. Compared to other steam generator irons, the tank is standard sized. You can expect around two hours of continuous use before the iron needs a refill. The tank is detachable. Also, you can fill the tank with water from the tap easily. How easy is this iron to use? You will notice a large red power button on the base. You select your fabric with left and right arrows. From there, the iron adjusts to the appropriate steam pressure and heat. 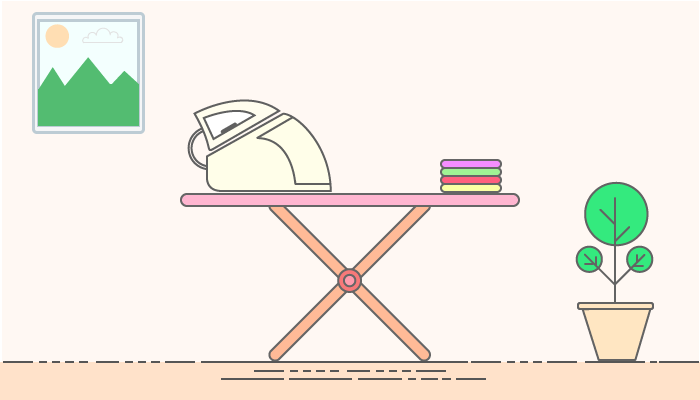 Nothing about operating this iron feels complicated—which is just how a household chore should feel, simple. Also, the handle of the iron is a comfortable experience. However, the steam button is located where most people will place their index finger under the handle. Watch out for the heat from the cords! If you look at the steam cord, you will notice its placement atop the iron. During our tests, the cords never impeded our ironing. However, we did notice the steam cord became hot after lengthy use. Therefore, be careful not to touch the cords when ironing. More importantly, check that small children and pets do not harm themselves on these cords. Here’s the question we have all been wondering: How well does this iron remove creases from fabrics? At 6.5 bars of pressure and 120 g/ min of constant steam, you will find no problems removing creases from garments. If you need some extra power, the iron provides a steam boost of 450 g/ min. Is this still not enough power? No problem! Tefal included aqua-boost vaporiser technology within its iron. This feature sprays a fine mist to wet fabric when steam is not enough to remove stubborn wrinkles. During our tests we found this feature removed creases better than many other irons on our list. We also liked the position of the button atop the iron. This is in a position for anyone to easily find the feature without accidentally spraying the mist. Do you need less power for delicate fabric? Again, Tefal designed this iron with you in mind. This iron includes five different heat and pressure options. You select each setting based on the fabric you want to iron (synthetic, silk, wool, cotton, and linen). We found the settings accurate, as the iron smoothed the wrinkles from each different type of fabric without damage. Speaking of damage, Tefal placed a microchip in the iron to maintain temperatures and steam pressures. This is a useful feature for when you press your iron against fabrics for a lengthy period of time. The fabrics will not burn, which is always a nice feature in irons. Here’s the deal: A soleplate plays a huge role in the smoothness of your iron. The Tefal GV8976 includes a ceramic plate for a durable, yet smooth plate. Tefal’s plate is scratch resistant. We found the iron glided with no issues across all fabrics. To form a better experience, the tip of the plate is thin and pointed. This fits easily inside pockets and around buttons to remove creases from all angles of a garment. The experience does not end at the coating of the plate. Tefal markets this iron with having an auto clean soleplate. This feature removes fibres that would normally mark or stain clothing. This works through catalytic oxidation—a process which converts fibres into gas and steam as the iron heats. This is a useful feature for extending the life of your garments. If you want to save time ironing, you will need an iron that heats quickly. Thankfully, this Tefal model contains 2400 watts. This allows the iron to heat in two minutes. This time is standard among other steam generators. Therefore you will not need to wait annoyingly long times to iron your garments. Much like other irons on our list this Tefal model includes an auto shut off switch. This is a great safety feature for those times you leave your iron unattended. Also, your power bill will not suffer if you ever forget to power off your iron. You will also find a safety carry lock feature. This attaches your base. This enables convenient storage and easy transportation around your home. If saving power is a concern for you, then you will enjoy this iron’s eco mode. During this mode, the iron reduces the heat and steam produced by the iron. This mode works great when you need less power. This iron includes an anti-calc collector. Over time, the iron cleans hard water and removes limescale from its surface. It then stores all the waste in a trey. Cleaning the trey is easy. You simply twist and remove a cork from the side of the steam-generating base. You then tip the iron, and all scale and waste drains from the iron. This is a unique cleaning feature. Thankfully, this is also a quick and easy form of removing unwanted material from your iron. Some of the best storage options in a steam generating iron. Aqua boost vaporiser is one of the best options for removing heavy creases. Steam button is not in a convenient position. Cord become hot after lengthy use. Tefal created an iron that will fulfil most your ironing needs. If you can bear with some strange design quirks, you will not be disappointed with this iron’s performance. Very few steam generator irons on the market remove creases as well as the Tefal GV8976. Options such as aqua boost vaporiser and a pointed soleplate only add to the efficiency at which this tool smooths the deepest of wrinkles. Which Steam Generator Iron Is The Best? We have now arrived at the grand question we have been asking since the start of these reviews. Unfortunately, we cannot answer that question easily. We found the five best steam generator irons within the UK. The best option depends entirely on your needs. If budget is not a problem for you, you cannot go wrong with one of the Philips models. The sensors are some of the best we have ever seen in an iron. Also, the anti-burn technology removes one of the most devastating parts of ironing—damaged garments. However, sometimes you will need to remove stubborn and deep creases. 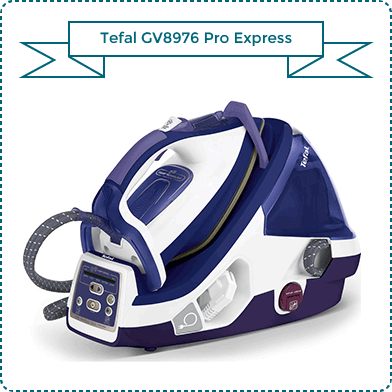 For this, the Tefal GV8976 offers some of the best options for smoothing fabrics. Also, who does not love convenient storage options? If you desire keeping your house clean and sanitary, the pro-hygienic technology in the Bosch TDS3880GB will help you in your tasks. In the process you will also receive some wallet friendly energy saving options. Do not forget about the well-rounded nature of the Morphy Richards 332006 model. The large water tank and auto clean functions will save you massive amounts of time when ironing in bulk. Therefore, at the end of the day, assess your own lifestyle. Consider features you will need. From here, you can choose a steam generator iron that will add convenience to your life. Remember, you have no wrong answers here. This answer simply comes down to preferences. How do you measure power in iron? The first measure you will learn is steam pressure. This is measured in bars. Higher bar pressures allow your iron to generate more steam. Why do you want more steam? This allows for straighter clothes with easier removal of creases. Heavier steam also penetrates through layers of fabric, speeding the ironing process. Most new steam iron generators produce a steam pressure of 6—6.5. bars. Steam output is another factor. As a general rule, higher steam outputs mean you will iron garments quicker and easier. This works because steam relaxes fibres in your fabric—allowing them to mend with the iron. Steam output is measured in grammes per minute. Most steam generator irons range from 80-120 g/min. This feature speaks for itself. Larger water tanks allow you to iron for longer, constant periods of time. You will find tanks as large as 2 litres. For most irons, a 1.8-litre tank will last for two hours before needing a refill. This is great for ironing large loads of fabric in bulk. To make the chore easier, water tanks are removable and easy to fill. You can easily see the water levels in light colored or transparent water tanks. Darker water tanks tend to be difficult to see inside. Thankfully, irons include water level indicators to remove some guesswork. Pay close attention to this part! This step not only impacts the smoothness of your iron, but also the lifespan of the iron itself. The soleplate is the piece that rubs against your fabrics. You will find a variety of materials for these—each with their own benefits. Aluminum soleplates are the most basic plates on the market. This metal does not clean as easily as other materials. The plates scratch easily. Why is this bad? Not only are scratches ugly, but they also result in less smooth irons. The scratches pluck into fabrics, causing wrinkles and tears. To make matters worse, aluminium plates become sticky over time. This will cause more wrinkles when trying to flatten creases. So, with aluminum acting as a bottom-grade metal, what soleplates should you try to find? One of the best options is a stainless steel soleplate. This metal spreads heat and steam evenly. Also, you will find this soleplate slides smoothly over your fabric when ironing. What’s the downside to stainless steel? These soleplates scratch easily when gliding across zippers and buttons. However, many brands apply non-stick coatings to solve this problem to some extent. If you want something better than stainless steel, look no further than a ceramic soleplate. This material is a durable and non-stick surface. You will also find even heat/ steam distributions and smooth gliding when ironing. Here’s the best part—these soleplates are easy to clean. What’s worse than spending hours ironing? Try spending hours cleaning that iron. With ceramic, you clean the soleplate with water and a cloth in seconds. Let’s be honest: We all value safety in our products. So, how do irons add safety features to their products? The answer is simple—auto shut-off switches. Most steam generator irons offer auto shut-off as a standard feature. After a certain amount of time, the iron powers off. Most irons shut off after 8-10 minutes. Some shut off in as short as 30 seconds. This is a great feature for those days you forget to power off your iron. Sometimes, you will need to answer a phone call or doorbell while ironing. In this case, you will not need to worry about the iron burning anything in your house. More importantly, this feature reduces the chances of children, pets, and loved ones harming themselves on the hot surface of the tool. Now, you can leave your iron unattended without fear. This feature is simple and easy to follow. We all know steam generator irons reduce the time to iron garments. Therefore, you will want a short heat up time to further lessen the time you spend performing the chore. How do you learn the heat up time of your iron? Simply check the wattage. Irons heat faster at higher watts. For most irons, 2400 watts will lead to a 2-minute wait before the tool is ready for use. What is one of the fastest ways to kill your iron? If your answer included limescale buildup, you are correct! Without routine cleanings, limescale will build in your iron. This clogs your device and prevents it from working. Most steam iron generators include anti-scale features for removing limescale. Some brands include auto-clean functions. Others will include a brush for scraping the scale. If you live in a hard water area, you will notice a faster buildup of scale. Therefore, this feature is especially important if you live in these regions. More importantly, we all love saving money, right? Anti-scale features will ensure your iron reaches a long lifespan. Your wallet benefits from you not needing to buy anti-scale products in the process. Anti-drip features prevent damage to garments from drips of water. This is useful since damaged clothing from drops of water is frustrating. Other times you will not stain fabric. Instead, the dripped water creates a mess on your ironing board or floor. You likely already noticed—these irons are huge. To help with storing these large household items, most of these irons come with a safety carry lock. These switches attach your iron to the base of the steam generator. How is this helpful? To start, this allows you to store your iron atop the base. When not storing, this feature allows you to easily carry your iron across the room to your ironing spot. Sometimes you will need to remove deep and stubborn creases for garments. By pushing Steam Boost button (usually located on the handle), the iron will produce a larger shot of steam. These boosts usually produce an output of 240-500 g/min. Vertical steam is a nice feature for removing creases from curtains, drapes, and other hanging garments. This is also a useful feature for clothing garments. Some suits and dresses must remain on a hanger. This is when you will need vertical steam, since laying these garments can harm their fabrics. For most irons, you repeated press the steam shot button for this feature to work. Most steam generator irons include variable steam settings. The settings are really another term for low, medium, and high. The difference here is that the iron prelists the materials (usually on a dial or with buttons) you need ironed. From there, the iron applies the correct heat and speed. Longer cords allow you to iron further from power outlets. This allows for more flexibility and comfort when ironing around the house. Other times long cords will allow you to iron larger garments more easily. The average cord measures three metres. Do you prefer ironing in quiet? If you answer yet, note that some irons produce less noise than others. Remember that clicking sounds are common with steam iron generators. Your device is not breaking. Also, note that these irons create louder sounds than a classic iron, especially when releasing steam. The noise is nothing too annoying. However, you may find some surprise when pressing the steam button. Since you are spending upwards of £200 on your iron, look for guarantees. Most steam iron generators ship with two-year guarantees. Usually, you will need to register your product to receive the full two years. Otherwise, you only receive one year or less. Therefore, do not cheat yourself a year of your guarantee—check if you need to register your iron. Did we help you find the best steam generator iron in the UK? It is okay to admit this is a difficult choice. Many strong performance irons exist within the market. You simply need to remember to choose the iron that reflects your lifestyle and needs. Do not forget that finding the right iron will take some time. The best option for you exists. Read our reviews and decide which iron addresses your lifestyle values best. Remember: an iron is not a household appliance to neglect. This tool will allow you to look amazing with your wardrobe. Therefore, you are making the right choice in finding the country’s best steam generator iron.